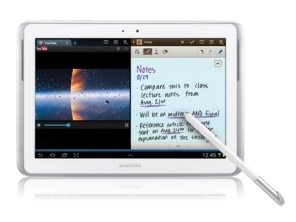 The Samsung Galaxy Note 10.1 is one of the few tablets that has been designed specifically for use with a stylus and handwriting recognition software. With that said, we figured it was time to do a serious experiment to see what it would be like to leave the pen and paper world behind for the Samsung Galay Note 10.1. Would you be interested in seeing a weekly update on tips, tricks, findings, hurdles, and benefits to moving to an all electronic environment as long as it did not eliminate any other reviews? Leave your thoughts and comments below about seeing more about the Samsung Galaxy Note 10.1 and how it handles the handwriting recognition and Microsoft OneNote software.